Giving a little can do a lot. Any client of good standing, can bring along 2 friends or family members as guests to their class. Each individual guest can attend a maximum of 2 classes at no charge. 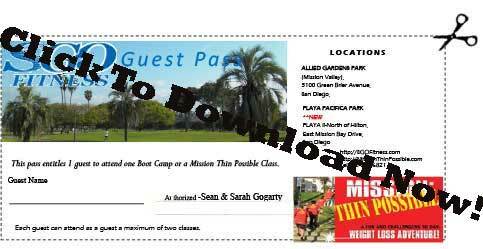 Just download a guest pass or obtain one from your trainer. Guests must also fill in our Waiver/Registration form. Both forms should be completed signed and given to the trainer at the time of your class. As part of drive to encourage and spread fitness and health among our community SGOFitness are offering Gift Certificates available for download at no cost to our active clients that can be passed on as gifts to friends, relatives, and aquaintences. These Gift Certificates, one per person, can be used towards purchase of SGOFitness training services, provided users are not a current client nor have been a client within the last 6 months. Referral Rewards-Value 25$ per Referral. Referrals from our current and past clients, friends, family, and aquaintences is a prime way to help our fitness family grow . It is a benefit to us all to maintain our community strong and healthy, and also helps us keep our prices low. As a thank you for your kind referrals, we would like to give you a 25$ referral reward for each referral that leads to a new client becoming a member with us. There is no limit to the number of referral rewards you can receive. Refer a friend or relative.